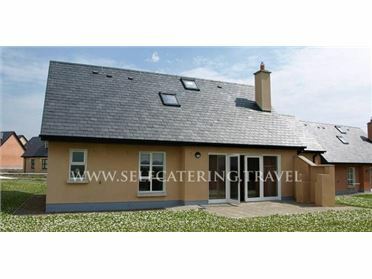 Greenhills Cottage 2 is a lovely detached cottage set along a rural road, two miles from the village of Kilcar in County Donegal. This upside down cottage sleeps four people in two bedrooms, consisting of one ground floor double and one ground floor twin with Jack-and-Jill access to a shower room. The cottage also has a first floor open plan living area with kitchen, dining area and sitting area with electric stove and a ground floor utility with woodburner. Outside there's shared off road parking for two cars and a first floor front decked area with furniture. Greenhills Cottage 2 is a great base for discovering all that County Donegal has to offer, with sandy beaches, walks and cycling trails all close by. The village of Kilcar is situated at one of the most westerly points of County Donegal. The village offers traditional music on a regular basis in many of their pubs, and it's located in an area of stunning natural beauty where wonderful views of Slieve League Cliffs and Muckross Head can be seen.